Derry City goalkeeper, Peter Cherrie and his wife, Justine who suffers from Functional Neurological Disorder. TODAY MARKS National Awareness Day for Functional Neurological Disorder (FND) and for one couple in particular it was a poignant occasion. Justine Cherrie, wife of Derry City goalkeeper Peter, never misses a game, home or away, and indeed travels to most training sessions as well; however it takes a lot of effort for her to be by her husband’s side. Justine was diagnosed with FND early last summer and admits that the condition, which affects the central nervous system, has taken a heavy toll on their lives in that time. Similar in severity to conditions like Parkinson’s or MS, it can affect all your limbs or speech and effects the brain’s ability to send and recieve signals properly. “At the start I had little or no idea what was happening,” she explained. “The very first experience happened while I was at work. They thought it was a stroke and I was taken to hospital in an ambulance but discharged soon after. FND means that Justine is on crutches most of the time and while her husband is currently based in the North West, she continues to commute from their home outside Dundalk, and some days are clearly easier.than others. 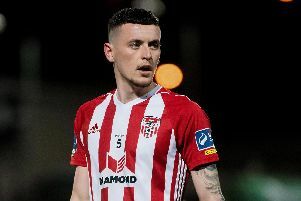 The Derry goalkeeper said his main concern was obviously Justine’s well-being and added that the condition made it more difficult to plan ahead. “On one occasion last week she opted to stay in the car while I did an hour in the gym. When we came out her legs had completely seized and she had to be carried into the house. “If she comes to football she has to rest during the day." With the FND Awareness event coming up, Derry City players and staff took part in a video to show support to for Justine and Peter, raise awareness of the condition and it was a gesture that delighted the couple. “I was really pleased with what they did and to be honest it was really good fun watching them do it” she said. No doubt that City supporters everywhere will be fully behind the couple as they battle to overcome those problems. Worldwide FND Awareness Week takes place on April 7th to April 13th. Check out Derry City Football Club’s FND Awareness video on Youtube.